Oontz Angle 3 Plus is the third speaker from a popular line of Oontz Angle speakers. Compared to its predecessor Oontz Angle 3, Angle 3 Plus is larger, delivers louder sound and punchier bass, and has a much larger battery. Oontz Angle 3 Plus is a great choice if you are looking for an inexpensive portable Bluetooth speaker under $40. It’s small and lightweight, it features Bluetooth, it’s IPX5-certified, and it delivers an amazing playtime of up to 30 hours at 2/3 volume. The speaker can be used indoors and outdoors and it’s a nice choice if you need a shower speaker. The sound is quite amazing for the size. It’s nowhere near some $100+ JBL or UE speakers, but for the price, you will get more than satisfying sound quality. We were not impressed by the bass response but you won’t get a much better bass for less than $35. Also, some nice and useful features like dual pairing and multi-host connection are not supported. If you are prepared to pay $5 more, you can get an upgraded version of Angle 3 Plus. This one is called Oontz Angle 3 Ultra. They look the same (size and design), but Angle 3 Ultra has larger drivers, delivers louder sound, has a newer Bluetooth version, and supports dual pairing and multi-host features. On the other hand, Angle 3 Ultra delivers significantly shorter playtime than Angle 3 Plus (20 hours VS 30 hours), so it’s not all black and white. If you need long playtime, Oontz Angle 3 Plus is the right choice. 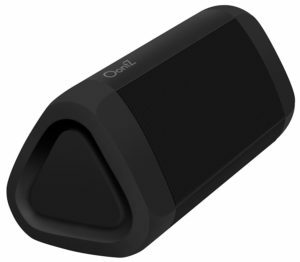 If you are looking for a good-sounding and inexpensive portable Bluetooth speaker, Oontz Angle 3 Plus should be on your shortlist. Angle 3 Plus wouldn’t be our first choice since there’s an upgraded version called Oontz Angle 3 Ultra, which offers some nice additional features and slightly better sound quality for $5 more, but even if you pick Angle 3 Plus, you won’t regret. You can’t get much better performance and better sound for that kind of money. All the Oontz speakers come in the same recyclable black and white box. Inside the packaging, you will find your speaker, 6in long USB to micro USB charging cable, 32in long AUX cable, and a quick start guide with step-by-step instructions. Wall adapter for charging is not included but you can use any 5V/1A or 5V/2A adapter. Carrying case is also not included and you will have to pay an additional $10 for it. The manufacturer didn’t change the recognizable design common for all the Oontz Angle speakers. So, you will basically get the same triangular speaker with Oontz logo on the top. The speaker is made of plastic and has rubberized edges. It can be placed vertically or horizontally but horizontal placement is preferred because of better bass reproduction (passive bass radiator is on the bottom). Black is the only color available. Front and back panels are covered with a black grille. 2 5W drivers are located on the front (there are no drivers on the back side). Left and right side are completely rubberized. On the right side, you will see the control panel. There are two versions of Angle 3 Plus and the only difference between these two versions is the control panel. The first version had only 5 buttons (Bluetooth/speakerphone, 2 volume buttons, play/pause, and power button). The second version has 2 dedicated track buttons. The controls on the second version look exactly the same as the controls on Angle 3 Ultra. We have tested the first version. On the bottom of the speaker, you will see two wide rubberized feet that prevent it from moving and a plastic mesh protecting the passive bass radiator. Oontz Angle 3 Plus, just like its predecessor Angle 3, has the same 5W drivers and one down-firing passive bass radiator. The driver arrangement is also the same but Angle 3 Plus is slightly larger and the size plays an important role when it comes to bass reproduction. Because of that small size difference, Angle 3 Plus has a slightly punchier bass. 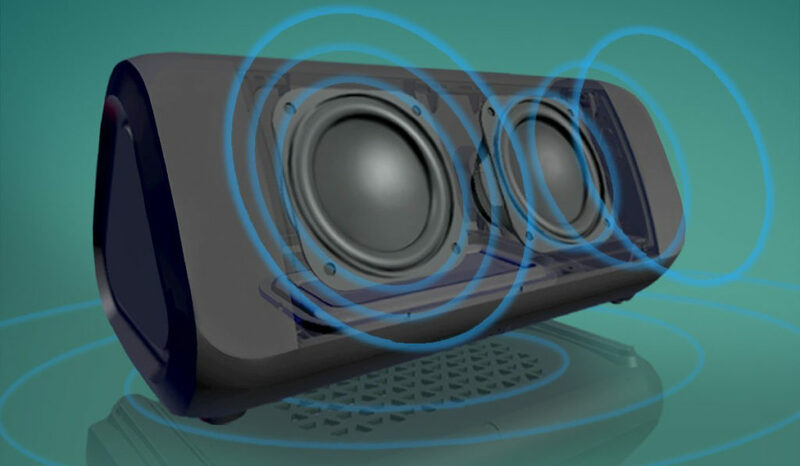 When it comes to build quality, there is practically no difference between the previous Oontz Angle speaker and this one. They both look sturdy, have rubberized parts, and they are both IPX5-certified. The only version that features IPX6 rating is Angle 3 Ultra. None of the Oontz Angle speakers are fully waterproof. Angle 3 Plus is only water resistant and it’s not submersible in water. As we have already said, the first version has 5 buttons. Four buttons (play/pause, Bluetooth/speakerphone, and volume buttons) are on the right panel, while the power button is on the back side, right above the rubber gasket protecting the AUX input and micro USB charging port. The speaker also has 2 LED indicators – Bluetooth indicator (above the Bluetooth button) and power/charging indicator (above the power button). The manufacturer doesn’t offer any info on the Bluetooth version, but it’s probably not one of the latest versions (it’s probably 3.0). The advertised range is 30ft. The additional Bluetooth-related features like NFC quick pairing, daisy chaining (wireless pairing of two or more Angle 3 Plus speakers), multi-host connection (pairing two phones with the speaker simultaneously) are not supported. If you want a speaker that at least feature support for multi-host and dual pairing, you should try the upgraded version Angle 3 Ultra. The battery is the most impressive feature of this speaker and it’s the biggest selling point. The advertised playtime is 30 hours at 70% volume, and you will get almost 35 hours at 50% volume. Recharge takes approx. 8 hours. Like most of today’s portable Bluetooth speakers, Angle 3 Plus has a built-in microphone. The mic is located on top of the speaker, right above the control panel. We don’t have any major complaints regarding the performance, but there are a few small glitches we would like to mention. Controls are simple and you don’t need a manual to figure out how to use them. The buttons are responsive. Our only complaint is related to volume controls. They are not synced with the volume controls on the phone and you have to turn up the volume on both devices. It’s not really an issue, but it’s still worth mentioning. We have no complaints regarding the build quality. 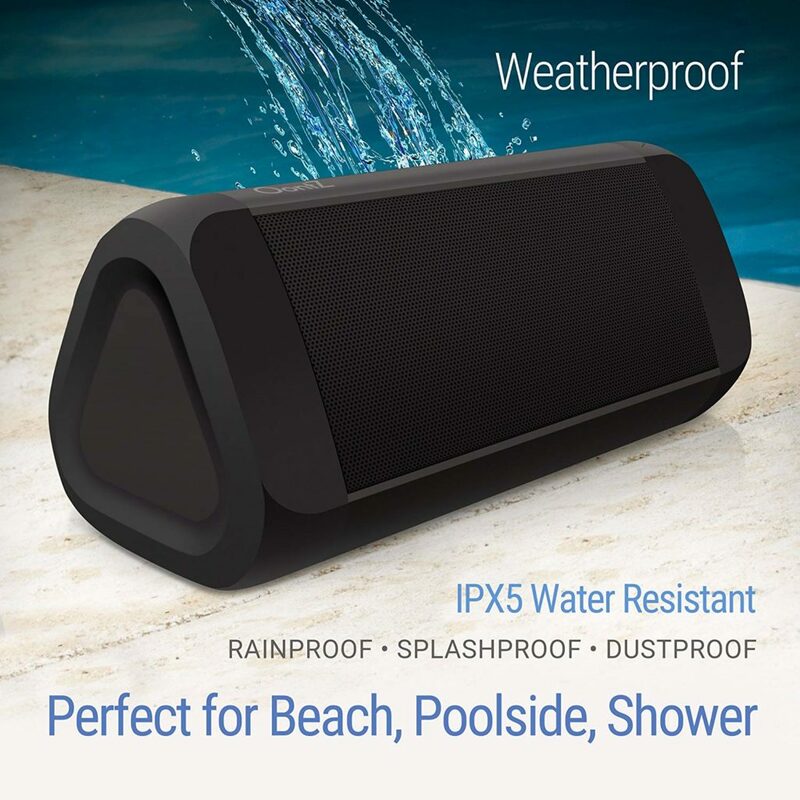 The speaker can definitely withstand a few splashes of water and it can be used as a shower speaker but we still prefer something fully waterproof when it comes to shower speakers. The battery delivers an amazing performance and we are quite happy with it. The speaker will turn off automatically after 15min of inactivity. Also, when the battery is at 15%, the volume will be automatically limited to about a half (in order to preserve the battery). The Bluetooth connection works as advertised, but the lack of all those fancy features like dual pairing and multi-host connection is still a problem and that’s why we prefer Angle 3 Ultra. The microphone delivers an average or even below-average performance. Everything works fine if there is no too much noise and if you are less than 5ft away from the speaker, but if there’s a little bit of noise or if you are more than 5ft away, your voice will sound distant and muffled. It’s kind of hard to complain too much when the speaker is this cheap. You will never get the same kind of sound quality as you would get with some $100 speaker, but you will get more than decent performance for the price. The only real issue is the bass. Not because it’s not on par with the price or size but because we like things with more punch. This one delivers some bass, but it still lacks body and impact. Just like any small or mini Bluetooth speaker, Angle 3 Plus is more of a mid-centric speaker with slightly boosted highs. Due to digital signal processing (DSP), the sound is quite clear. When there’s too much bass in a song, the DSP chip reduces the bass in order to preserve the low midrange and make the sound more balanced and clearer. The speaker is also quite loud for its size and the distortion is minimal because of DSP. Stereo separation is practically nonexistent and it can’t get better since Angle 3 Plus doesn’t support dual pairing. When it comes to cheap Bluetooth speakers under $50 or under $40, the competition is huge. There’s a bunch of no-name Chinese brands in this price range, but some speakers still manage to stand out. Here are three more great inexpensive speakers. 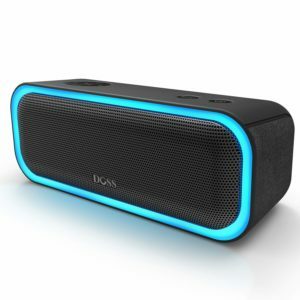 Doss SoundBox Pro is one of the Amazon’s bestsellers. It reminds us of Sony XB20, but it’s significantly cheaper than XB20. It’s still $10 more expensive than Oontz Angle 3 Plus. The most noticeable feature of the SoundBox Pro is the light show. That’s what makes this speaker really amazing. You won’t find any lights on Angle 3 Plus. When it comes to battery life, Angle 3 Plus is a clear winner (30 hours VS 10 hours) and if you need long playtime, SoundBox Pro is not the best choice. SoundBox Pro features a newer Bluetooth version and has a longer Bluetooth range. It delivers better and more stable Bluetooth connection. SoundBox Pro also supports dual pairing while Angle 3 Plus doesn’t. SoundBox Pro packs more punch, but Angle 3 Plus delivers clearer sound and more detailed mids and highs. Both speakers have built-in mics. Tribit XSound Go is a nice-looking speaker. 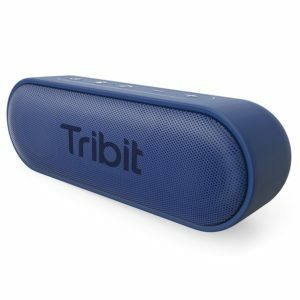 It looks like a Beats Pill knockoff and it’s practically priced the same as Oontz Angle 3 Plus. If you are choosing between these two it all comes down to your needs. Do you care more about the playtime or about the waterproofness? XSound Go is more rugged and it’s more appropriate for outdoor use since it’s fully waterproof (IPX7 rating), while Angle 3 Plus is only water resistant (IPX5 rating). When it comes to battery life, Angle 3 Plus delivers 30-35 hours at 50% volume, while XSound Go delivers up to 24 hours. XSound Go features Bluetooth 4.2 and delivers longer Bluetooth range than Angle 3 Plus. Both speakers have very similar audio performance and they both have built-in mics. Anker Soundcore 2 is another nice-looking, fully-rubberized portable Bluetooth speaker. It’s similarly priced as Angle 3 Plus and they are both highly portable. 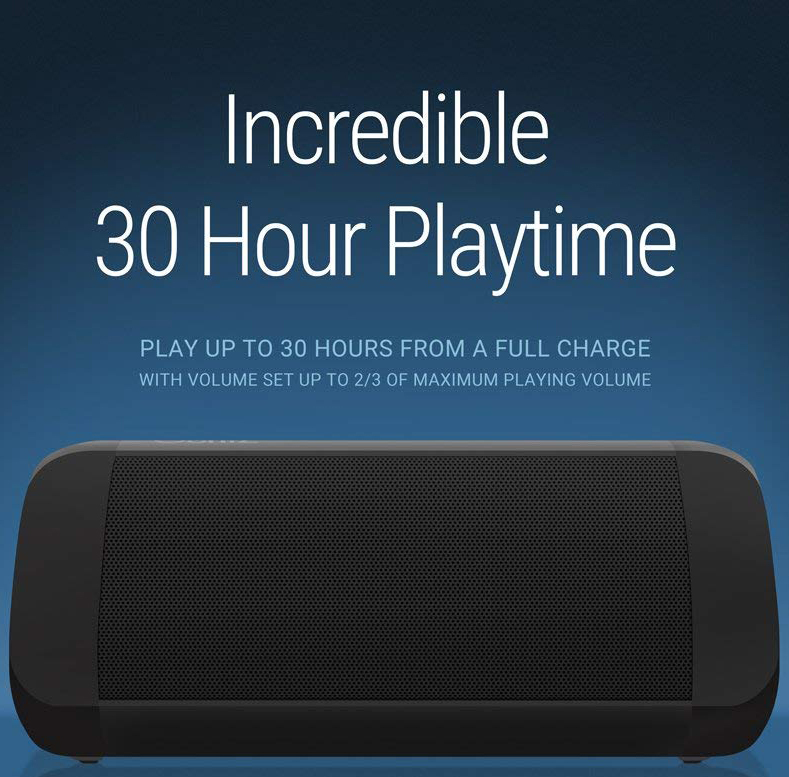 Angle 3 Plus delivers longer playtime than Anker Soundcore 2 (30-35h compared to 24 hours). Anker Soundcore 2 and Angle 3 Plus are IPX5-certified (water resistant). 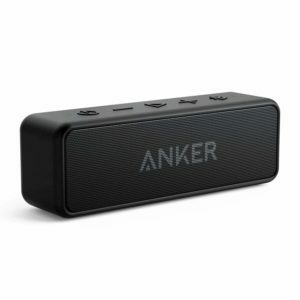 Anker Soundcore 2 features Bluetooth 4.2 and has a slightly longer Bluetooth range. Soundcore 2 also delivers slightly louder and bassier sound. Oontz Angle 3 Plus is a great mini Bluetooth speaker. It’s quite cheap and it delivers an impressive performance for the price. The most impressive feature is an extremely long playtime and that’s probably the biggest selling point. Besides that, the speaker is highly portable and it’s IPX5-certified which makes it great for outdoor use. Since there’s also an upgraded version of this speaker (Angle 3 Ultra), Angle 3 Plus would not be our first choice, but if your budget is set at $35 and if you don’t want to spend more than that, Angle 3 Plus is a very good option.